She could've fooled me in this picture. 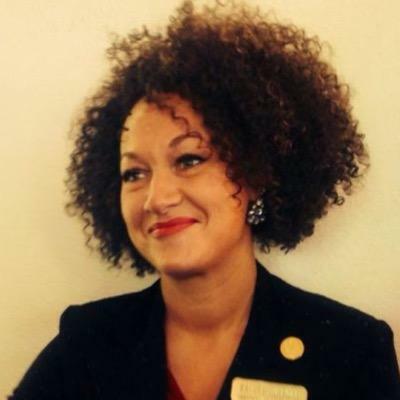 Do you remember Rachel Dolezal? You know, the white NAACP chapter president from Spokane who pretended to be black (and it all kinda blew up in her face). During her brief time in the spotlight, she raised all sorts of questions regarding racial and ethnic identification. At the height of the #AskRachel questions, my friend Ashley asked me a few questions herself. Ashley: What does it mean to you to be an American? Arielle: I don't have any idea. The only thing I can think of is fighting for what you believe in and having strong opinions. Ashley: What does it mean to you to be an African American? Arielle: I'm not sure if I consider myself to be an "African American". I think to be ______ American, you have to have strong cultural ties to wherever your people came from. As a black American, obviously my ancestors came from Africa, and I love this! We have traces of slave culture, but Africa? Not really. Ashley: Is every black person granted the right to the diaspora's "image"? Do you think that black Americans can relate to Africa? Arielle: I was thinking about that, actually. There's a thin line between appreciation and appropriation. Being proud of our heritage and displaying it is a way of preserving our origin, but I think sometimes we take it too far. Everyone needs to understand that not all Africans walk around with dashikis and tribal paint while playing the drums in their huts! In many places in Africa, they are just as Westernized as we are. Many people are reaching for pre-colonial times and Africa as a whole has simply evolved from that point.